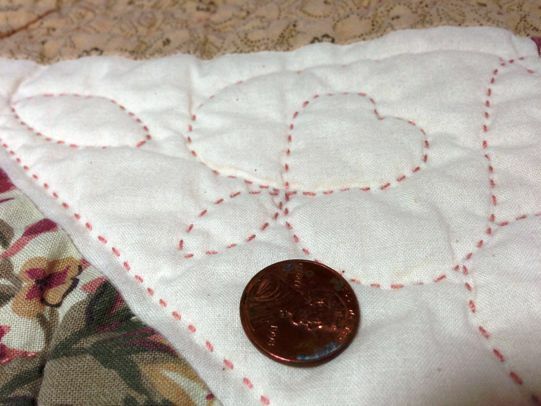 Hi, I was wondering if anyone could advise me about handquilting in a hoop....I have a queen sized quilt...and am only able to quilt towards myself, therefore I am constantly turning the hoop...what do you do with the rest of the quilt? I keep getting it tangled all around me as I literally turn the hoop every curve....argh!!!! Is there something I don't know????Thanks! I hand quilted a queen size in a hoop and like you can only quilt toward myself. So I spent a lot of time turning and rearranging! I tried a floor hoop but couldn't get the hang of it. I will wait to see if we get some suggestions. I bundle the quilt on my lap and just twist away. When it becomes too much or when 30 minutes have passed, I stand up, stretch and untwist the quilt Oh and usually I find one of my 5 cats in there somewhere. I usually save my quilting for winter or when the air condition is on cold. 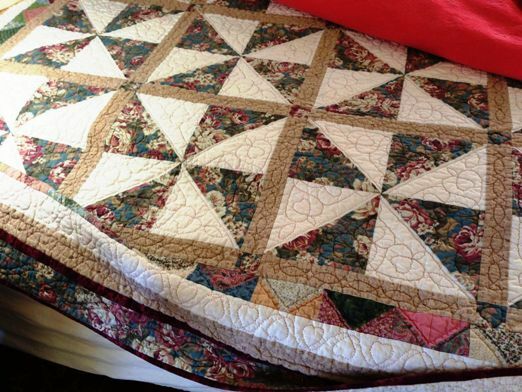 I sometimes sit at a kitchen or dining table, and spread out as much as I can of the quilt on the table to lessen the weight. I've had the same thing happen to me when I quilt in a hoop. Sorry I don't have the magic answer for you. Maybe that is why I quit quilting in a hoop...it was really a struggle! 1. I twist and turn and then stand, stretch, shift, take a potty break, get a snack, whatever, then quilt and twist and turn some more. Sort of like Cyn. 2. I throw the body of the quilt across a 20" x 35" folding table that I have pulled up near me, and use that to support the weight and twisting....until the above breaks apply. 3. I try to turn the hoop in 90 - 180 degree turns only, first to the left then to the right sort of thing, and that seems to help untwist some of the mess. 4. I find I am so relaxed when I quilt that little things like having to untwist the quilt hardly bother me at all. you could try rolling the portion your not working on and use quilt clips. You could roll each area around the hoop so that portions not being quilted just stay in a roll. 4 full size (3" round) quilt clips. Holds rolled quilt for machine quilting. Plastic, will not rust, stain or snag. Will not scratch machine or furniture. I have a QSnap floor quilting frame. Bought it with a 50% coupon from fabric store. I can quilt from right to left and away from myself using my thumb thimble. Do you call a thumb thimble a thumble? Jan, I'm relatively new to this board AND quilting, but always read your posts because you seem so knowledgeable and experienced. Do you hand quilt many of your creations? Still in the process of learning to hand-quilt. When I first started out, I too was using a hoop. And like you it was a constant struggle with the quilt all jumbled. Such a struggle that I considered not hand-quilting. Then one of my quilting friends said.. if it's a struggle, try it without the hoop. Can't say it's still not a struggle, but for some reason it's easier. I meet once a week with a hand-quilting group and we lay the quilts up on tables, so it's easier. At home, I just hold the part I'm working on in my lap and let the rest of it fall to the floor. **Disclaimer: A/C is cranked up AND I'm under a ceiling fan. I also used the twisting and turning to get up and stretch... have fun!! I too end up with the quilt in a twist as I quilt from right to left-- I have found that I quilt in more comfort using an large oval rather than a round hoop as I can get my arms around it better and turn it-- I have seen a hoop that has a turnable base, either in a lap or a floor model, that looks interesting but quite pricey -- I usually handquilt sitting in a wingback chair with my quilt lying across a footstool and quilt away while I watch tv -- solution?? You can't rush perfection. Like Jan say's take breaks, stretches, etc. I use a Grace frame and my thumb when going north or west to east. You will figure something out. What's important is to relax and enjoy it. I do hand quilt, though fewer projects than I'd like to because I have some nerve damage in both hands. With this I can barely feel the needle in my fingers, so I no longer use a thimble (I know, gasp!). I use my nail to push the needle and there fore rarely take more than one stitch at a time. And, believe it or not, I have only pushed that needle under the nail a couple of times in many years of handquilting. I use a larger needle -- so I can be more aware of it -- and often like to use a larger thread of contrasting color so that my larger stitches show up well; I feel they add to the design. Threads I use might be Sulky brand 12 wt. cotton (pretty blendables), perle cotton #8 (in the little balls), Sashiko thread (Sashiko is a Japanese style of stitching), leftover candlewicking thread (which is now hard to find but is very much like candlewicking thread) and even #10 crochet thread. I love the #10 crochet thread because it can be found at Walmart, and other easy places, in those BIG balls which are easier to keep up with while quilting! The photos below show close-ups of one of my "big stitch" quilts. I usually take 5-6 stitches to the inch with these threads, rather than the regular handquilting's 8-12 stitches per inch with regular or waxed hand quilting thread. I used to handquilt until I got my LA. I am a very unorthadox quilter in that I don't use a thimble and I push the needle with the nail of my index finger or middle finger when quilting toward me. Like Jan the needle has only slipped and jabbed me under the nail a few times. But what happens is I end up drilling a hole in my nail. So then I found an open end thimble but I can't leave it on. I start my thread then slip it on and take 7 to 9 stitches, slip it off then pull the thread through. I taught myself to quilt away from myself by learning to use my thumbnail to push the needle. Bought an open thimble for my thumb too and go through the same procedure. So I have the advantage that I can quilt both toward and away from myself and at an angle. I can't quilt side to side when handquilting. I found to twist the hoop counterclockwise then the next turn twist it clockwise. This helped avoid the tangled mess. I quilted two quilts in a hoop, though they were both smaller than yours. I found that sitting at a table with the hoop on the table and the quilt spread around it worked best for me. Still, there is lots of turning and twisting. I was doing STID, though, nothing fancy. I'm a terrible handquilter, actually, have never mastered those beautiful straight stitches I see in others' work, but I liked doing it. I mostly hand quilt, very little machine quilting is done at my house, and I quilt mainly queen to king size quilts in my lap in a 14 inch hoop, the twisting and turning is just part of the love that goes into my quilts. I enjoy every minute of it. That way, I get to snuggle (so to say) in each quilt I make. Most of my quilts go to family, that way they know they are all quilted with love. Have a good day everyone. 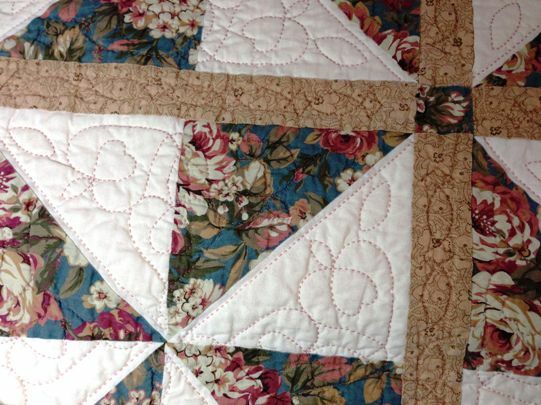 Jan, your quilting is so pretty! thanks for showing us!! Thank you all for your responses! I'm keeping at it, and it's becoming a little less awkward I wish I could quilt in different directions and with my thumb...maybe in time! Thanks all! I've only hand quilted 2 quilts, a twin and a full sized quilt. I can only quilt toward me and have found that sitting on the sofa or on my bed where I can throw the rest of the quilt is the only way I can do it. The twisting just comes with it and you get used to it. Every once in a while I have to jab the needle into the top of the quilt (not all the way through!) and untwist, before picking my needle back up and starting again. And I usually have the tv or the radio on for some noise in the background. Good luck! Thank you for this thread! I've learned a lot. Like Jan, I have nerve damage in my hands and arms and need to use a larger needle but love the big stitch look. Unlike Jan, I'm not very accomplished and need lots of inspiration and practice.